Each year solid offensive tackle prospects move inside to guard and find themselves taken within the first few rounds of the NFL Draft. 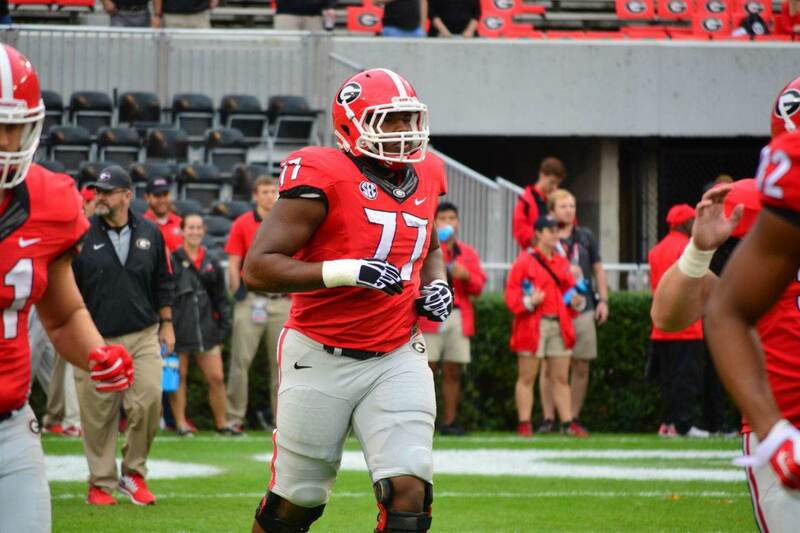 Georgia Bulldogs’ left tackle Isaiah Wynn is the next tackle who is set to have a successful NFL career on the interior rather than at his collegiate position. Isaiah Wynn was the best offensive lineman on one of the best running units in the country. Starting 12 games at guard in 2016 before moving to left tackle for his final season, Wynn has experience at each of the offensive line positions on the left side. Measuring at 6’2″ 308 pounds with 33 1/8th arms, Wynn will fit in as a plug and play guard for any NFL offense. Wynn’s best trait is his feet. Balanced and determined in his footwork Wynn rarely lost his footing or lunged at defensive linemen. In pass protection, he is patient and powerful with his punch. He is also smooth enough as an athlete to block explosive pass rushers. He shows the ability to anchor in pass protection as well, and looks to have fluid hips. On this rep, Wynn is lined up at left tackle. I linked this clip to show off his patience and footwork. He smoothly transitions from a kick step to a power step, communicates with his left guard on the switch, and then picks up the looper effortlessly. As a run blocker Isaiah Wynn is impressive as well. Once again it’s his feet that steal the show. He is incredibly agile and fluid on his feet, but is powerful as a run blocker as well. Even as a tackle this season Wynn showed his ability to pull, something he’ll be asked to do in the NFL a lot once moving to guard. Because of his light feet, Wynn looks pretty natural blocking in space. I’d like to see him block better on the second level, but getting there isn’t an issue. Unlike the last guard I scouted, UTEP’s Will Hernandez, Isaiah Wynn isn’t going to wow you with his size or frame. He has a bit of a different build for an NFL offensive linemen, but considering his play style I think it works. If he did have that “prototypical size,” Wynn would be considered a top tackle in this draft class. Because of those size, frame, and strength concerns however, he will most likely be asked to move inside at the next level. Ideally, with his size and athleticism, I would play Wynn in a zone blocking scheme. Starting at left guard for a team like the Dallas Cowboys would be the perfect situation for Isaiah Wynn. I have Wynn graded as an early second round player, and believe that is ultimately where he will be taken.